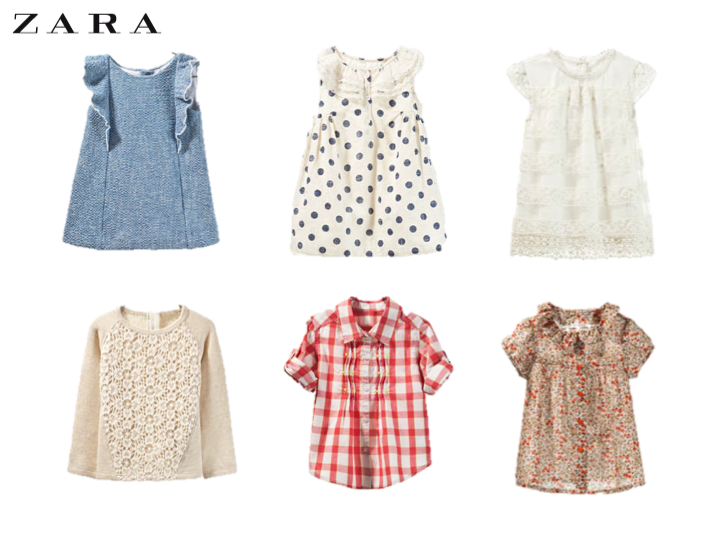 Zara has absolutely darling girls styles for spring! If you've never looked at Zara before, you need to. It's a European based company with great style. The spring line has updated classic styles and the colors are so subtle. I want to order a few things for Drue, the trouble will be deciding what to order. 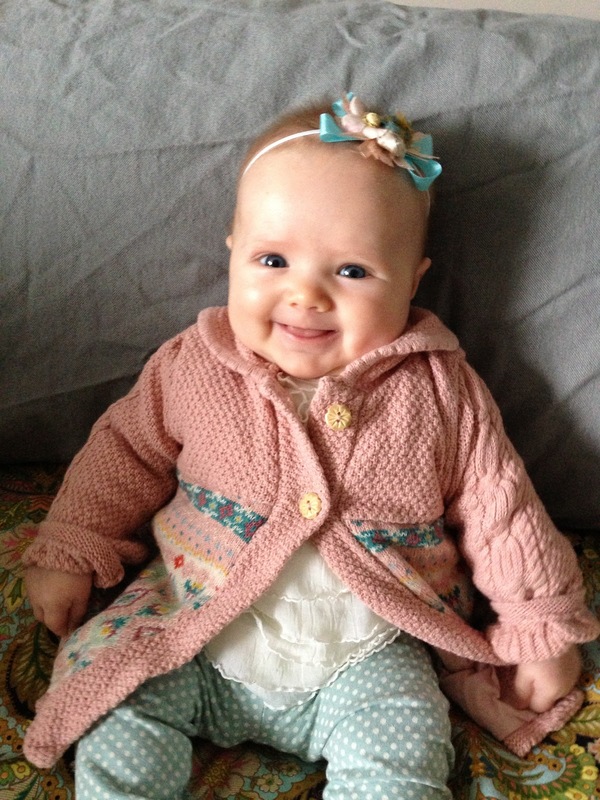 I love baby clothes and I always want to buy too many - self control is just so hard! I just wish they didn't grow so quickly. What stores are you shopping for your spring wardrobe? So, I've always wanted to be a graphic designer. I debated it when I was in college and second guessed myself because it was an art degree and having to do art formerly made me so nervous. I have secretly always regretted not doing graphic design. I am constantly in awe of the digital beauty created by graphic designers. For the last four years, I worked in marketing and I loved working closely with the designers to produce catalogs, collateral, etc. They were probably so annoyed with me because I was always at their computers watching them work. One of these days I will buy the Adobe Creative Suite and learn how to create beauty on a computer. In the meantime, I am lucky that there are some options for those of us who don't have Adobe. I just discovered a pretty cool site to help me out a little in a beautiful way. 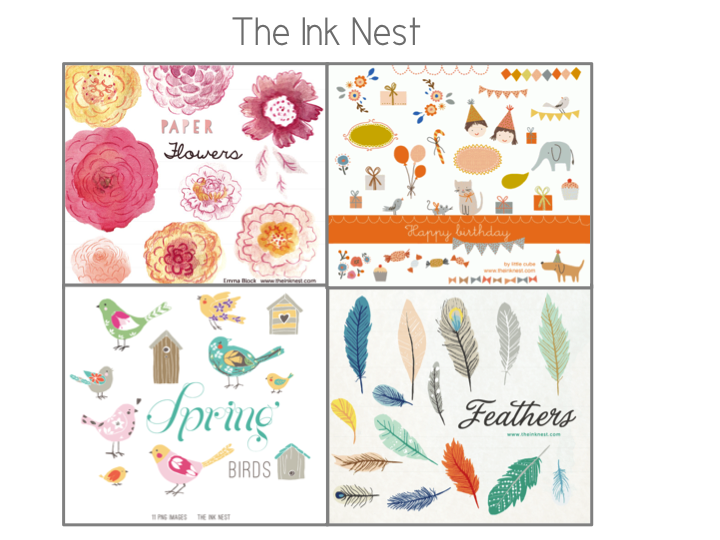 It's called The Ink Nest and they have the cutest designs and clip art you can purchase for around $8 per set and use personally or on your blog. 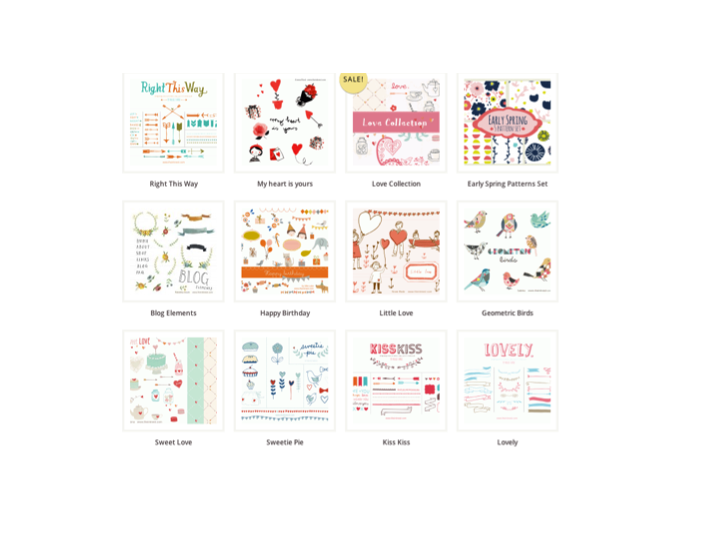 There are already a few I would like to purchase for artwork in my kids room, for card making or just about anything. The designs are so fun, unique and fabulous in every way. What a brilliant concept! Here are a few of my favorite designs, now just to figure out what I want to do with them . . . I'm not gonna lie, this week was a lot of work, but it's important to make holidays special and memorable which usually requires planning and effort. We had so much fun cooking and crafting together! Jared and I wrote things that we love about each of the kids on hearts and put them on their doors each night leading up to Valentines so this morning, their doors were plastered with hearts! The kids and I worked on making Valentines and Valentine boxes during the week and yesterday I baked most of the day. It's only Valentines morning and I'm already treated out. It was fun spending time together and enjoying each other's company. You just can't beat creating memories! 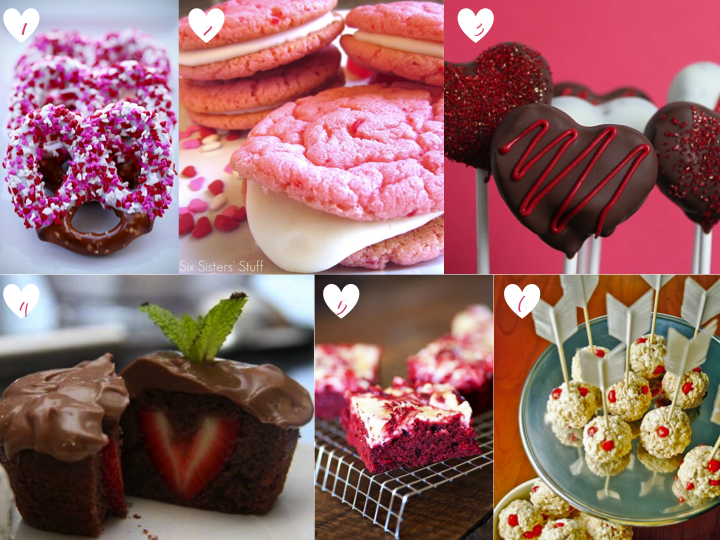 How do you celebrate Valentines with your kids? We made these darling rice krispie treats which we cut out with heart cookie cutters and dipped in melting chocolate and added sprinkles. The kids gave these to their friends. I made these completely irresistible nutella stuffed chocolate chip cookies with sea salt. They are amazing! For breakfast this morning we had heart shaped cinnamon rolls. We are all on sugar overload, but completely worth it! Most of these ideas came from Pinterest, seriously, thank goodness for Pinterest, what a lifesaver! Happy Valentines to everyone! Yep, rugs again! When I find something good, I have to share it! 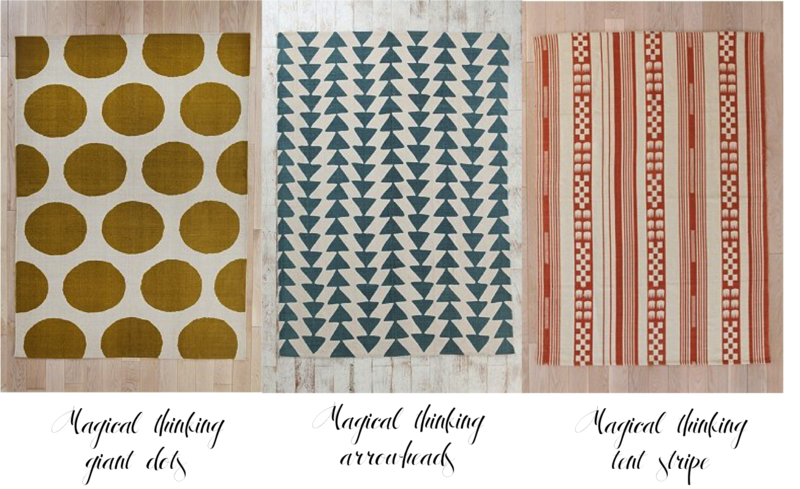 Urban Outfitters has great rugs for the price. I am loving their Magical Thinking series, the colors are so subdued and yummy. 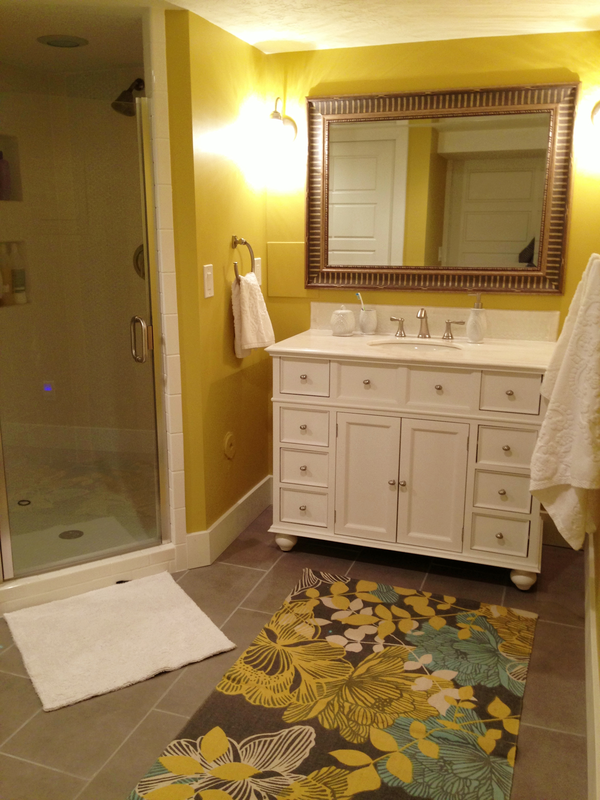 We recently remodeled our basement bathroom and I had purchased rugs from HomeGoods, Target and West Elm and none were the right fit. I ended up ordering one from Urban Outfitters and it added the perfect punch of color and whimsical fun. The only downside is that they don't wash well in the washing machine, but so far ours has been good with a quick shake outside and spot cleaning. I really want to order one of these, just have to find a place for it first. How was your weekend? Ours was a relaxing one, it was snowy once again so for the most part we hung out at home, which is how I like it! We cooked a couple of great meals I discovered on Pinterest pinned here and here, watched a movie, went to Paisley's swim meet and played some good old board games. My only wish is that weekends would last a little longer, Mondays are always hard as everyone goes their separate ways. I definitely don't miss going into the office, I'd much rather spend my day with baby Drue. 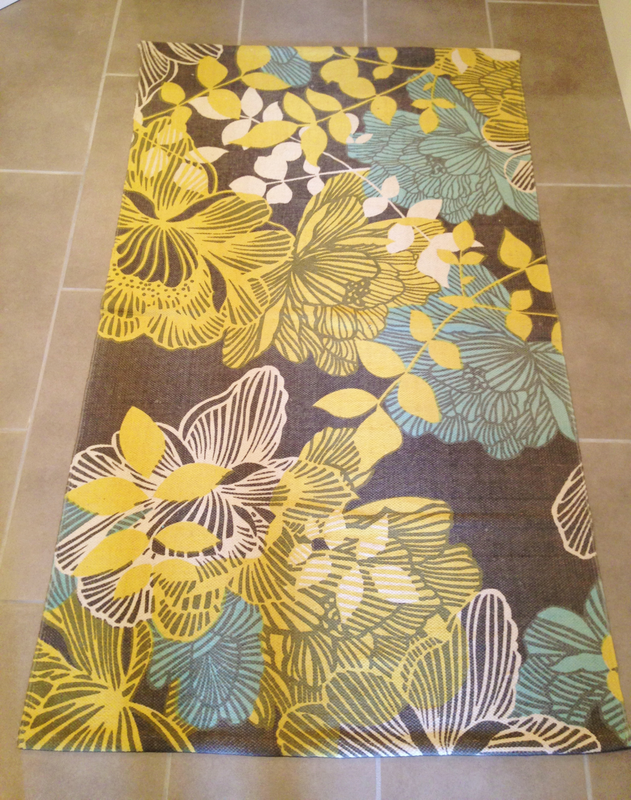 We finally managed to get out the rug I purchased from Rugs USA back in July. Between having the baby and just being genuinely busy, we just hadn't had any time to get it out. I have to say I love how it looks, it adds so much warmth and color to our living room. The style is a perfect fit, I couldn't be happier. I have my eyes on one of their runners, now I just need one of their killer sales to make the purchase! Time is almost running out! Now is the time to gather together your ideas for treats on the big day next week. My kids love any excuse to celebrate with sweet treats and why not make them cute at the same time? I love these ideas I found on Pinterest, now I just have to decide which one to make! 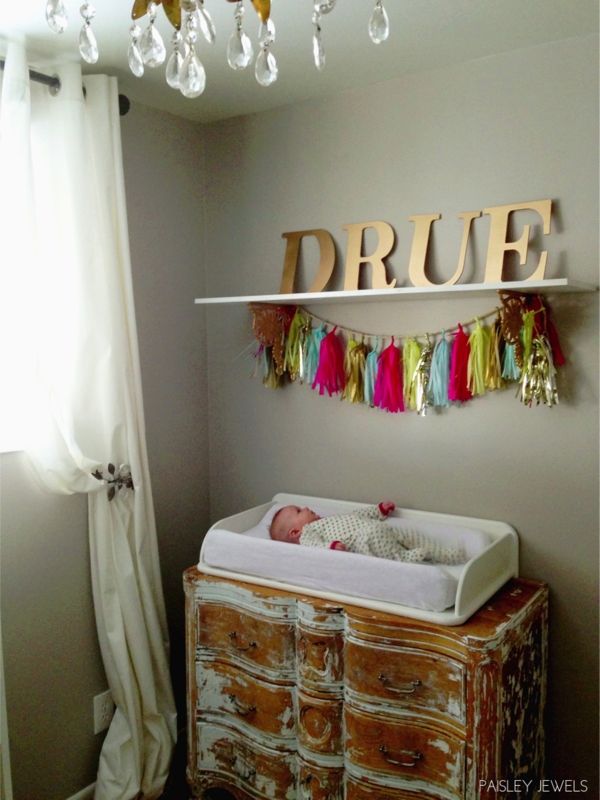 We welcomed baby Drue to our family on October 25th, 2012. We had two kids, Paisley age 10 and Porter age 8 and are so excited to have a baby in our home again! 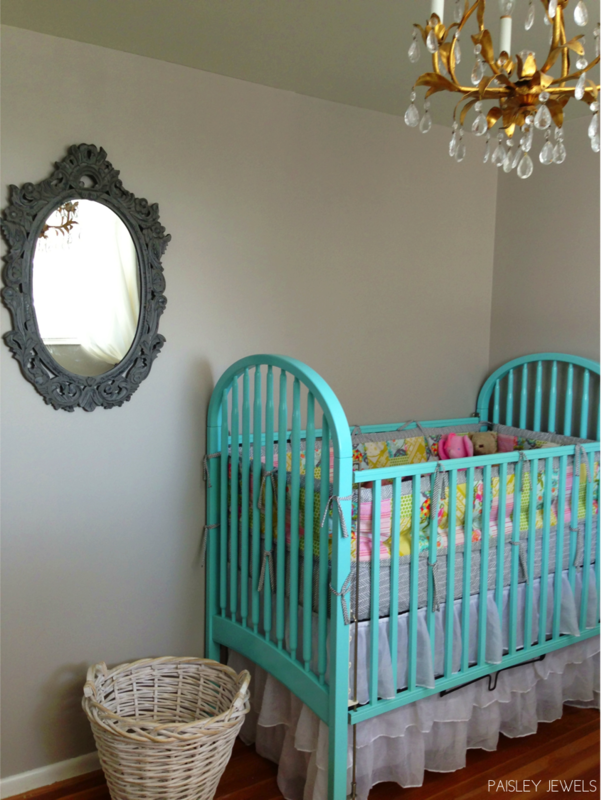 I had kept Paisley's baby bedding but it was kind of dated when I got it out and I decided I wanted to start new. I ended up doing the entire room based on the colors in the bedding fabrics because I loved all of the patterns and colors! I am big on style and details, but not a big spender. I like ending up with a designer look for a fraction of the cost. There are a lot of DIY projects here and I'll do my best to link back to original sources. The mirror was purchased at HomeGoods for $39.95, the chandelier is antique and was already here when we bought our house. The crib is 21 years old and I gave it a major facelift by spray painting it with an aqua Krylon paint and finished it off with a coat of poly. I am so pleased with the color and how it turned out, I have to say it was a good decision! I also made the bedding and I love, love, love it! 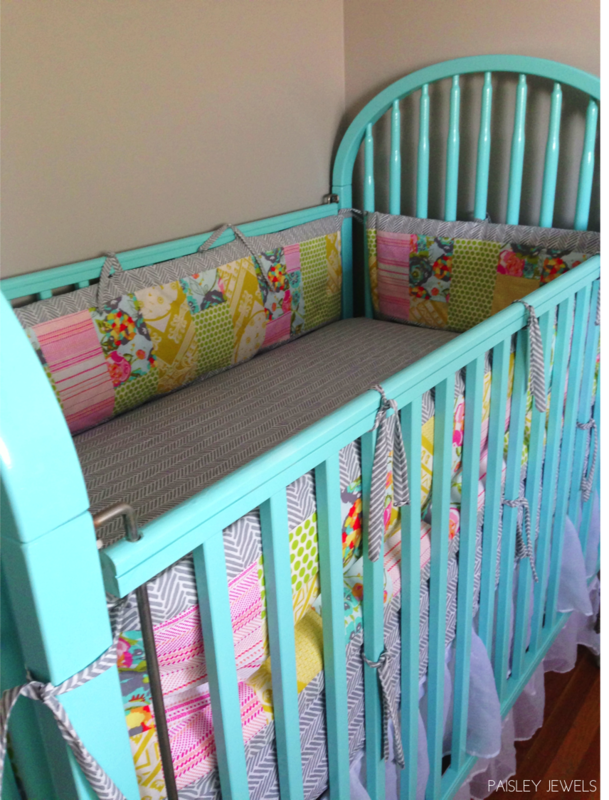 The crib skirt was made from a shower curtain purchased here. I cut it into the right length and stuck it on the mattress frame using sticky velcro, so easy! The grey and white bed sheet was a twin size purchased at Target and sewn to fit a crib size. I also used the leftover material on the bumper. The bumper was made using a tutorial found here. I had an old bumper I didn't like and I slipped the new one right over the top and it worked great! I used fabrics from Jay-Cyn, Playdate, Anna Marie Horner and Lily Belle. I took a risk ordering fabrics online and not really knowing if they would work together and I couldn't be more happy with how it turned out! The lamp was purchased at HomeGoods, the drapes are from Ikea and the tie backs are from Urban Outfitters. 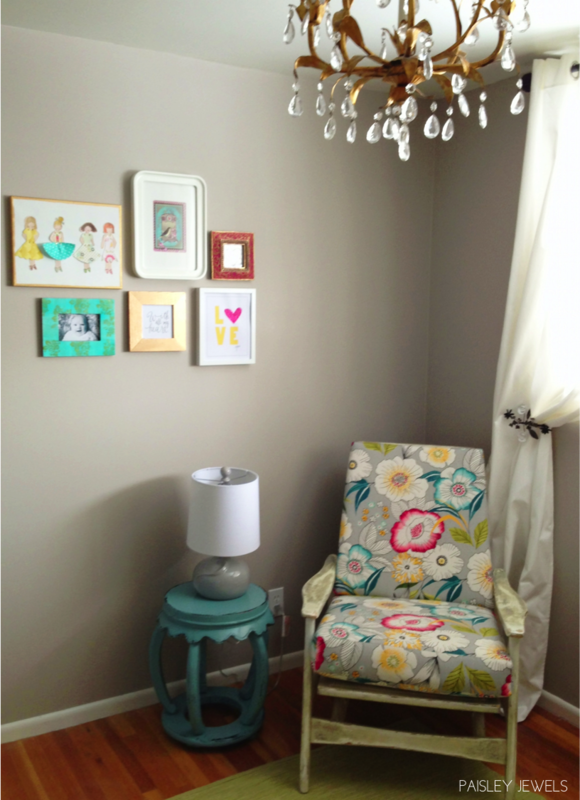 The rocker chair was originally purchased for $15 and I had the cushions made. It is so comfortable and I love the bold print! 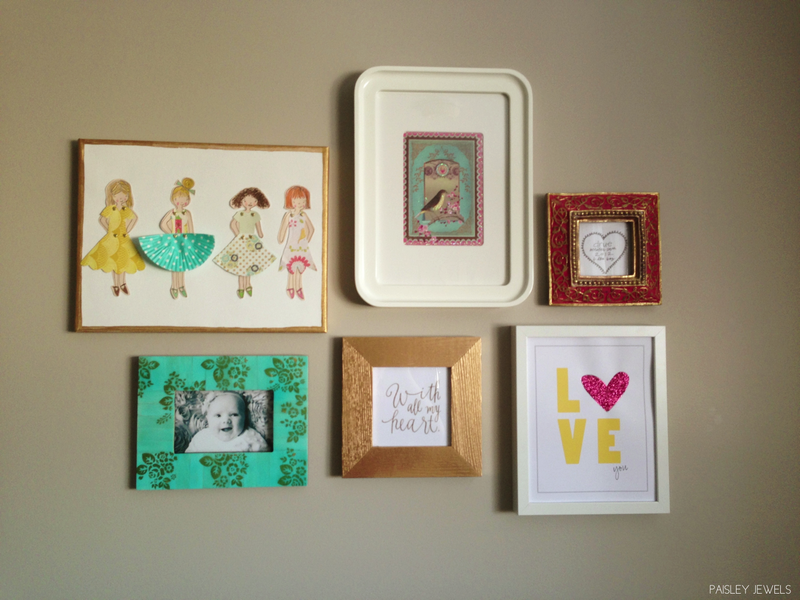 The little gallery wall turned out really fun in just the mix of colors and styles. The paperdolls were done at a kids art project class I do in the summers and then glued to a blank white canvas with a gold painted edge. The next frame is from Ikea with a page from a calendar from a couple of years ago. The aqua and coral frames are both from HomeGoods. The quotes were printables I found online and put them in basic frames. This corner is one of my favorite parts of the room. I found this beautiful dresser at a second hand store for $40. It already had this stripped finish and I loved it so much I left it the way it was. The shelf has old pewter Anthropologie brackets from about 13 years ago that I spray painted gold. The letters were purchased from Hobby Lobby and sprayed in the same gold paint. I made my tissue tassels using this tutorial. They add the perfect punch of color. I hope you enjoyed Drue's room. It is a great feeling to have it finished and love how it looks! I love D.I.Y. projects because they not only save money but they add so much to the overall finished look. 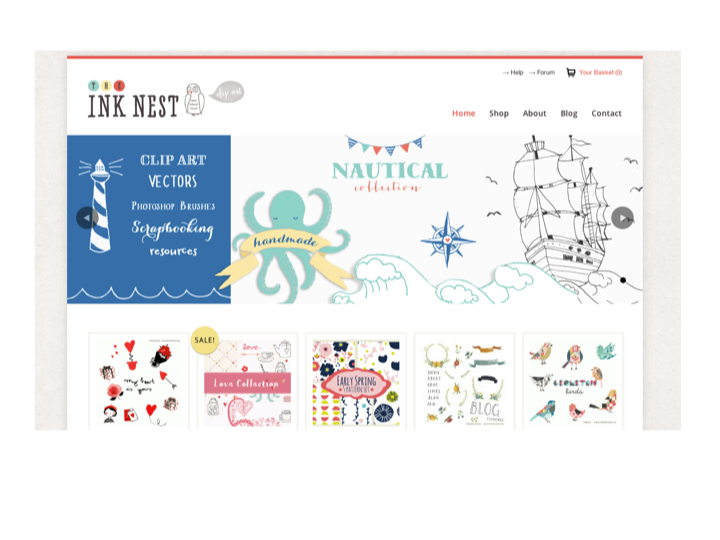 I have a three month old and searched far and wide for cute baby bedding. Unfortunately, the only sets to suit my taste were too pricey for my budget! So I ended up sewing my own, I'll be posting pics of her nursery soon, I'm still putting up those last finishing touches. 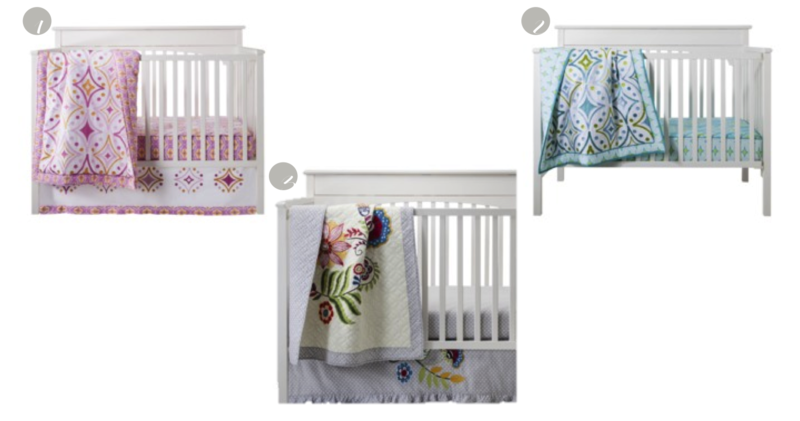 I was pleasantly surprised when browsing Target's website recently with their new additions in the nursery department. If they would have had these cute styles, I would have definitely made the purchase.